Lately I haven't reviewed many new beauty products but I'm well aware that some of you guys are also following this blog for beauty stuff. 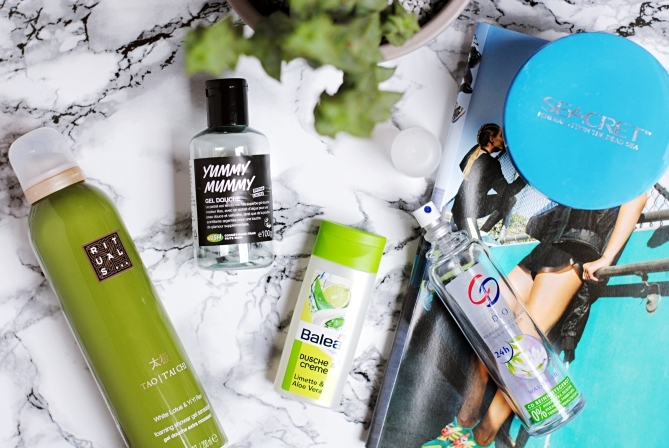 So I hope that you'll find some interesting products in this empties post. New product reviews are certainly planned for summer! From all shower products I've tried so far, the Rituals foaming gels are still among my favourites. I love how soft they feel on my skin. If it weren't for their price I would purchase them regularly. This shower gel from the Tao range has a soft flowery scent, but I prefer Rituals' fresher scents. As much as I love Lush I always seem to be disappointed by their shower gels. This one is from last year's Mother's Day range but the Yummy Mummy shower gel is again available this season (as you could see here). To me the scent is too artificial and doesn't smell of anything I could identify. The last shower gel I emptied this month comes from the German drugstore dm's home brand Balea. It smells just like you would imagine, soft and fresh. As it actually really contains aloe leaf juice it seems like the perfect shower gel to take on holiday as it is refreshing and soothing at the same time. I still try to stay away from potentially harmful ingredients like aluminium, so I chose this deodorant which is furthermore free from parabens, mineral oil and silicone. We all know that a deodorant can't prevent sweat but this one has a really strong fresh smell to cover possible sweaty odors. I did a review of this body scrub some time ago so it's time to tell you my final opinion. The rough salt and almond oil are a perfect combination as they leave the skin all soft and hydrated. To me it's probably the best body scrub I ever used. However Seacret is a direct selling company which makes you dependent on a private seller if you want to purchase any of their products. Unfortunately I had some really bad personal experiences with the brand so I would not buy there again. What are your beauty discoveries of the month?